As a Berliner myself, I dare say that Berlin is probably the most European of all capitals. In no other city in Europe does East meet West the way it does in Berlin. History has been made here more than once. Berlin constantly reinvents itself, shifts and morphs as it responds to a changing world. You will see that in Berlin you can easily spend 3 days or more and not get bored for a minute. With this 3 day Berlin itinerary I want to help you make the most of your stay in the city. I want to show you the top Berlin sights, help you find a good hotel to stay when visiting Berlin and recommend the trendiest restaurants that are also frequented by Berliners. This itinerary will start with the best known sights like the Brandenburg Gate and will go into more details on the third day. I will bypass those attractions that I think are not worth your time and that you should only see if you have more time to spend in the city. I hope you will like my selection! Note: This post may include affiliate links (labelled *) which may pay me a small commission should you decide to make a booking with one of my partner sites! In this map I have marked down all the places, things to do and attractions that you will cover in this itinerary. The red dots show itinerary stops on day 1, the blue dots for day 2, and the orange dots are suggestions for your day 3. Start your trip to Berlin with a visit to the Brandenburg Gate, Germany’s most iconic landmark. It’s a great first stop as you will want to take some photos and just ponder over the fact that you are in just the spot where East Germany and West Germany were separated by the Berlin Wall. On the eastern side, see if you can make out the line of cobblestones in the asphalt that follows the former border between the two Germanys. On the western side of the Brandenburg Gate, head south on Ebertstraße where you will see the Holocaust Memorial, or Memorial for the Murdered Jews of Europe. The monument is a huge area with stone blocks that you can walk through. Experience the disorientation and confusion as you lose yourself in the maze, then have a quick look at the museum underneath the stone blocks if you want to know more. 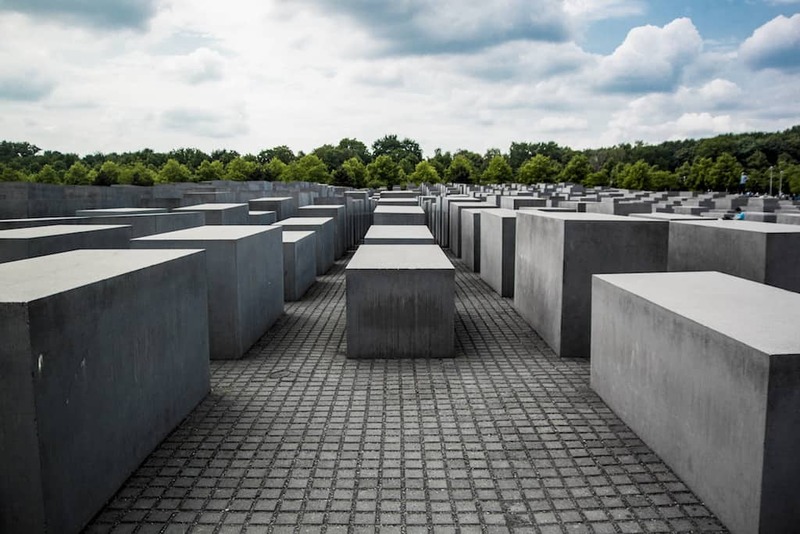 The Holocaust Memorial is a must-see when staying in Berlin for 3 days or more. Photo by Giulia Gasperini. From the Holocaust Memorial, find your way to the Reichstag building, the German parliament building. It’s a pretty old government building in an otherwise flash and fancy government quarter which has only been back in business after reunification. 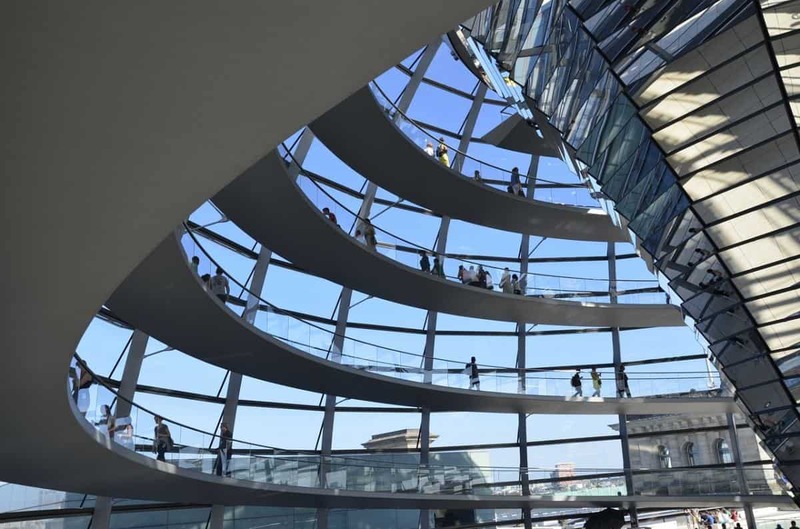 Hopefully, you have pre-booked your ticket to visit the glass dome on top of the Reichstag for some amazing views of the city and for learning more about the exciting history of this building. Entry is free but if you would like to pre-book a table to coffee and cake at the rooftop restaurant Käfer, have a look here*. Walk along the river Spree until you reach Tränenpalast, Palace of Tears. This is the former departure hall where families from the East and West would say their good-byes for unknown periods of time, hence the name. The museum looks at the scenarios of departure and separation and is free to visit. Friedrichstraße Station next door is a major train station which will take you to your next stop on our Berlin itinerary. Around the station there are a number of cheap eats for a quick lunch. I suggest you try currywurst with french fries and mayonnaise at Witty’s just under the overpass. Take the S-Bahn to Ostbahnhof to get to your next attraction of the day, East Side Gallery. This open-air gallery is a free art exhibition which shows murals from international artists on a section of the Berlin Wall. The murals are artistic interpretations of the Cold War, the Fall of the Wall and the first time after that. It’s a great location to take photos. Also walk down to the river for views of Oberbaumbrücke Bridge. Cross Oberbaumbrücke to get into Kreuzberg. If you are interested in street art, check out the murals along Skalitzer Straße, the main thoroughfare. Otherwise, don’t show up too late for dinner at one of my most favourite restaurants, Sadhu, for authentic food from Pakistan (Falckensteinstr. 41). 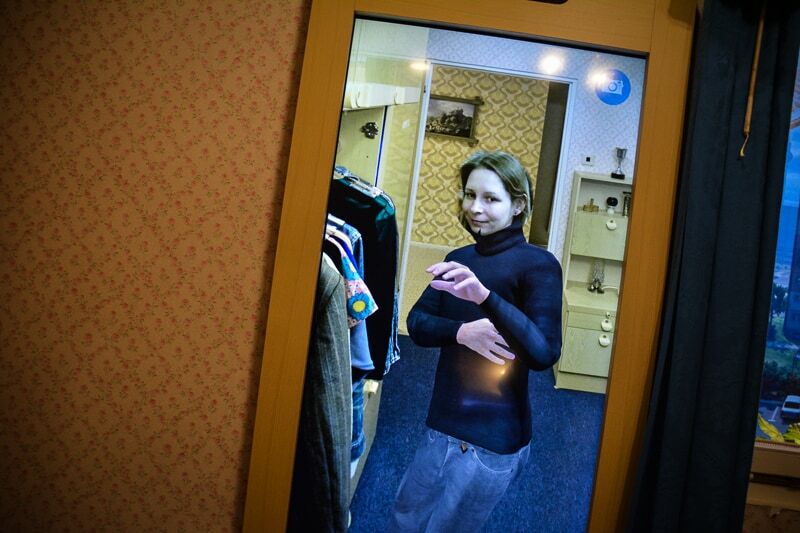 At the DDR museum, I virtually got to try a number of Eastern German clothes. I also got to feel the fabric of real GDR jeans. Start your second day in Berlin by taking the train to Friedrichstraße Station or Hackescher Markt and walk to Museum Island. This UNESCO heritage listed river island in the historic heart of Berlin is home to some of the best museums in the world. While you could visit any of these museums, I suggest you focus on Pergamon Museum. Built specifically around the Pergamon altar from Asia Minor, the museum shows treasures from the Middle East and Greek and Roman antiquity. While the room with the temple is sadly closed for renovations, there are still many reasons why you should visit. Highlights include the Market Gate of Miletus, the Ishtar Gate and Processional Way of Babylon as well as the Aleppo Room. Skip-the-line tickets highly recommended, click here*! After your visit head to boulevard Unten den Linden for a bit of a walk and some sightseeing. All around Lustgarten you will find some of Berlin’s most beautiful old buildings including the State Opera, Alte Wache, Berlin Cathedral (Berliner Dom), and Berlin Palace (currently under construction). DDR Museum nearby is a great interactive museum that will show you the world of Communist East Germany in all its aspects. Private life, work life, public life, media, government and many other parts of strictly controlled East German society are explained here. I am sure you will love riding in an interactive Trabi car, visiting a prison cell for political inmates and peeking into a 1:1 East German apartment complete with TV, kitchen and bedrooms. Get your skip-the-line ticket here*! For lunch and some more sightseeing, walk over to Alexanderplatz, the major hub of East Berlin. Alexanderplatz is the home of the TV tower which you may want to visit but it is quite pricey to get up there (if you still do want to go, get your fast track and restaurant window seat ticket here*). There are a number of cheap eats in this area as well including at the station and in the shopping centres. Have a quick lunch before you head to the next stop on our itinerary. I recommend you try a doner kebap, for example at Pergamon Döner und Pizza in the station building. In the afternoon, take suburb line U2 to get to Stadtmitte. From here it is just a couple of minutes’ walk to Checkpoint Charlie, a former border checkpoint where the American sector met the Russian sector. All along the side streets you will find interesting photos and explanations about this place. You may want to take a picture with a re-enactor soldier here! Walk down Leipziger Straße towards Potsdamer Platz, which once used to be the busiest traffic intersection in Europe. After WWII the land lay deserted as it was right between East and West Berlin. Today, Potsdamer Platz is the best place to see modern German architecture. Have a quick look at the shops at Mall of Berlin as you walk past. Then head to Sony Centre or Potsdamer Platz Arkaden to browse some more. For dinner, take the S-Bahn from Potsdamer Platz to Yorckstr. for one of the best Indonesian restaurants in Berlin, Tuk Tuk (Großgörschenstr. 2). It’s your third day in Berlin and you have already covered a lot of ground! I am sure you will be exhausted by now… This is why I only give you a couple of options to choose from rather than a strict itinerary. This is your one day when you can do whatever you want! 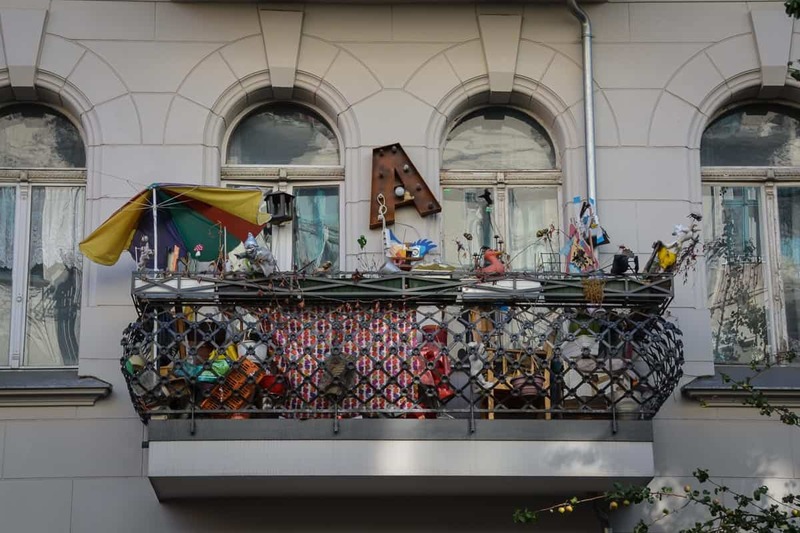 You can choose to join a guided tour (some ideas below), visit one of the many markets (depending on when you visit) or walk some of the trendy neighbourhoods such as Friedrichshain and Prenzlauer Berg. Is it a Sunday? Then head to Mauerpark in the morning to visit the amazing flea market and designer market. Listen to the street bands, sing karaoke in front of a raving crowd and shop for some unique Berlin souvenirs. Afterwards, walk over to Berlin Wall Memorial Park to learn more about the death zone and the way the Wall was built. From Nordbahnhof, take the tram to Ristorante Roma for some excellent Italian food and pizzas (Friedrichstraße 129). 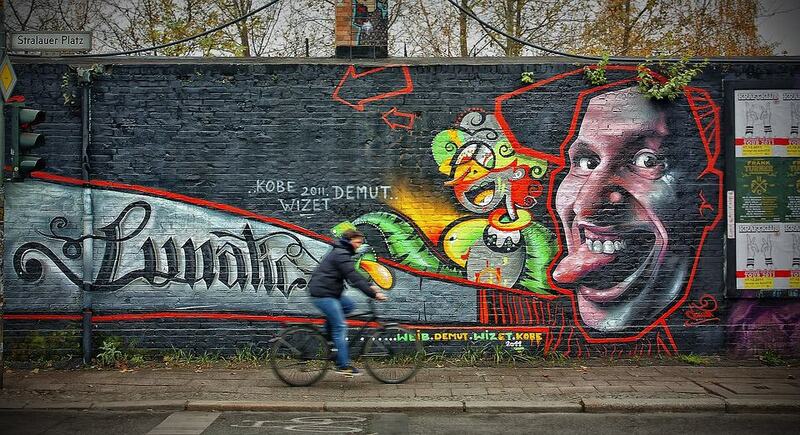 Street art is a big thing in Berlin. One of my most favourite spots is the courtyard next to Hackesche Höfe. For some amazing history and street art, visit Hackescher Markt and dive into the world that is Hackesche Höfe. These interconnected courtyards have been remodelled from poor tenements into high-end designer shops, art galeries and speciality shops. Just a couple of metres further, explore the street art in the courtyard leading to Anne-Frank-Zentrum. Visit the Anne Frank Museum for some touching historical insights or shop till you drop at the many highstreet stores in the neighbourhood. For lunch, try simple but tasty Hackescher Hof Restaurant & Café (Rosenthaler Str. 40-41). In the afternoon, visit a “kiez”, that is a neighbourhood where locals live, and soak up the atmosphere. 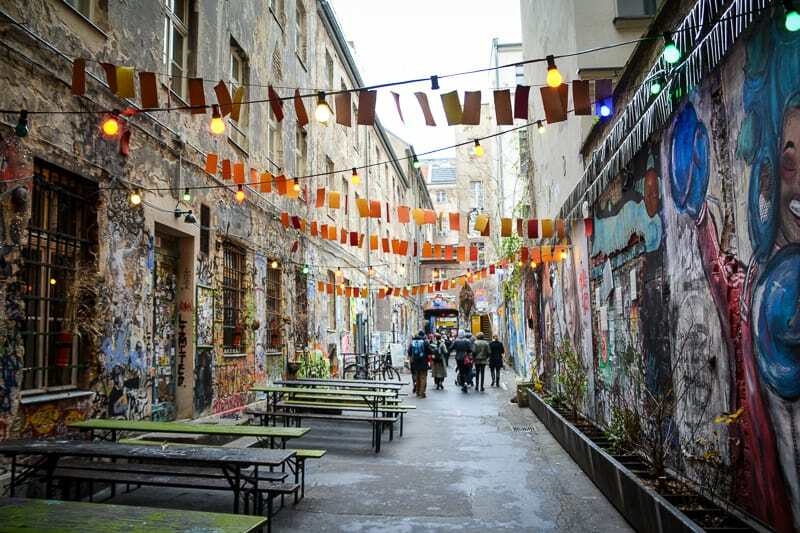 I suggest you try Boxhagener Platz in Friedrichshain where you will find plenty of bars and moderately priced restaurants in the surrounding streets. Have some exotic but cheap ice-cream at Eispiraten, try a cocktail during Happy Hour in one of the bars in Simon-Dach-Straße, and finish your day with dinner at delicious Nyom Vietnamese Restaurant (Gabriel-Max.Str. 17 / Krossener Str. 11). Alternatively, spend the afternoon at Urban Nation Museum and see some fantastic examples of urban and street art. The museum is free to visit and is surrounded by more street art in the surrounding streets, in particular in Bülowstraße. Restaurants can be found nearby at Winterfeldtplatz, for example excellent Amrit for Indian cuisine (Winterfeldstr. 40) or Berkis for Greek food (Winterfeldtstr. 45). For those of you interested in beautiful castles, Charlottenburg Palace (Schloss Charlottenburg) is easy to reach and a great day trip destination on the last day of your Berlin itinerary. The town of Potsdam with its many parks and castles is a bit further away, but may be the perfect day trips idea for you! This concludes your 3-day itinerary of Berlin. I hope you enjoyed these suggestions! Look at this cool balcony. Germans generally take pride in their apartments and they love to decorate them to feel homely and comfortable. Some people like to take it to the extreme, but I love it. The following section of this article is a bit of bonus information if you are still in the early stages of the planning process for trip to Berlin! Berlin has plenty of options when it comes to hotels and other accommodation. Budget travellers will want to have a look at the reviews of some of the hostels around town, such as Wombat’s Hostel*, Generator Hostel* and 25hours Hostel*. These places are all clean, hip and trendy. There are also a lot of different hotels that provide good value for money in a central location. Since you have only limited time in the city you should think about staying at a hotel that is close to a number of attractions. 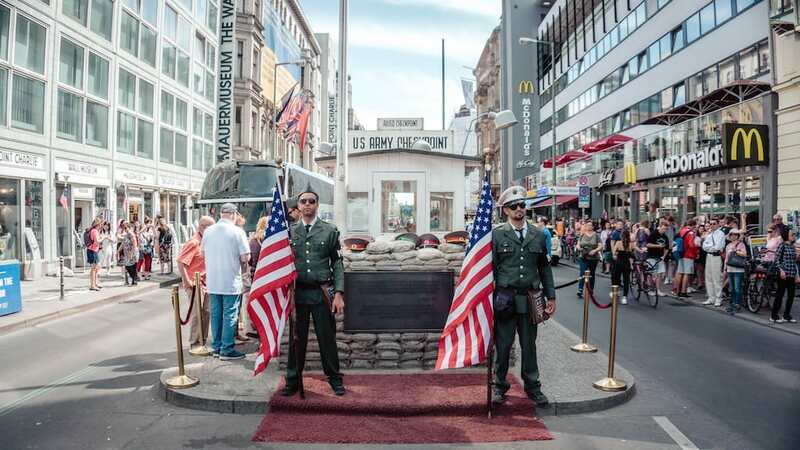 For this 3 day itinerary I recommend you check prices and availability at Mercure Hotel & Residenz Berlin Checkpoint Charlie*, Mercure Berlin Wittenbergplatz* and Adina Apartment Hotel Berlin Hackescher Markt*. 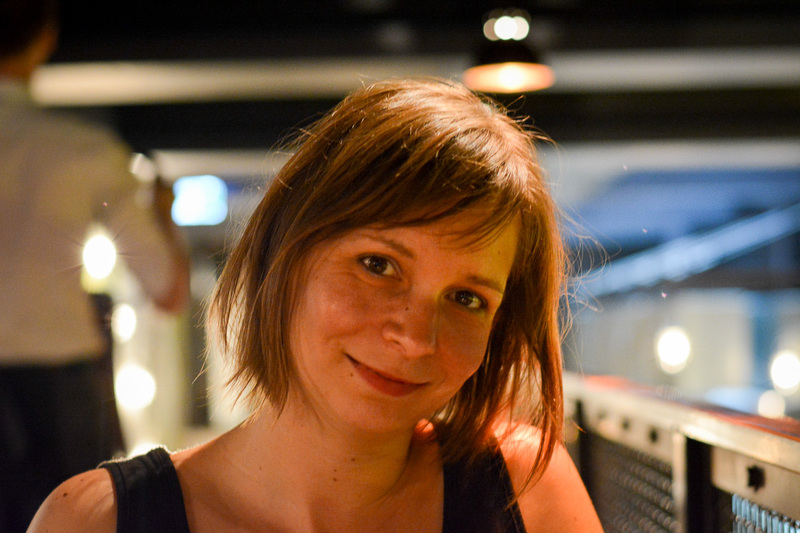 Another option to find cheap accommodation in Berlin would be Airbnb. Berlin is a very spread out city! Wondering if you should stay in Charlottenburg, Mitte or Kreuzberg? If you are unsure which area to select for your stay in Berlin, read here my detailed Berlin neighbourhood guide for further tips and more information. It’s easy to find cheap flights to Berlin, in particular if you plan ahead. Both Ryanair and Easyjet have connections to the German capital, and of course there are countless of other European airlines that fly daily to Berlin. If you are hailing from the US, there is currently a direct connection from New York. Other long distance routes include Doha, Toronto and Singapore. Since Berlin is a big city you will need to buy a travel pass for the public transport system. For the purpose of this 3 day itinerary, I would suggest you purchase the regular day ticket for zones AB. It does not include your trip from Schoenefeld Airport but you can add an extension ticket C for this purpose. The reason why I do not suggest you get any of the tourist passes such as the Berlin Welcome Card is that this itinerary does not feature a lot of the discounted attractions that are included in the pass. In fact, many of the Berlin sights mentioned here like the Holocaust Memorial, Checkpoint Charlie or Hackescher Markt are free to visit anyway. If you want to make up your own mind, have a look here. Tickets can be bought online, at ticket machines or from selected vendors. Lastly, some attractions need to be pre-booked to skip the queue or to reserve a spot. In particular if you would like to visit the Reichstag make sure you get your free ticket as early as possible (up to three months in advance). Skip-the-queue tickets are mentioned in the itinerary above where it makes sense to pre-book. Berlin is a great place to explore with an experienced guide. Check out these recommended tours which will show you some intriguing aspects of the city. Find Your Perfect Guide Book! 3 Day Berlin Itinerary: Discover Berlin With the Help of a Berliner! As a Berliner myself, I hope this itinerary has given you all the answers that you need for your upcoming trip. However, if you do have any outstanding questions or comments, please feel free to get in touch!